Lewes’s relegation was confirmed after the 2-1 home defeat to Bishop Stortford on Monday. Nobody at the club ranted and raved about poor decisions, bad luck or conspiracies. 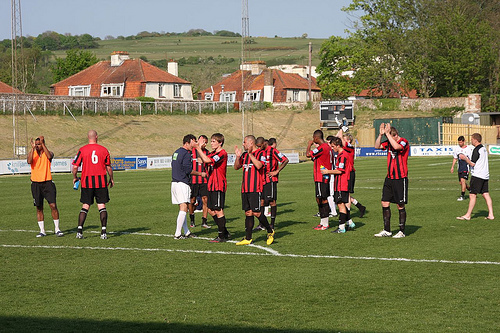 Dignity was the order of the day at the Dripping Pan with preparations for the final game away to Boreham Wood. The club wanted to end the season with a win, not just for the fans but also to try and finish third from bottom. The reason? In the six year history of the Conference South no team finishing third from bottom has eventually been relegated. Many have tried such as Maidenhead United, Hayes (twice), Weston-Super-Mare, Thurrock and Worcester City but none have succeeded. In fact even finishing second to bottom is no guarantee of demotion as only two teams have ever been relegated in this position – last season Weston-Super-Mare the latest example of staying up in penultimate place. So where there is uncertainly, there is hope. And what better uncertainty than in Non League football. So it was with some hope we traveled up to Borehamwood to say goodbye to Lewes’s annus horribulus, as well as undoubtably a few of the playing squad. Boreham Wood FC (note – this is not a spelling mistake – Boreham Wood is the name of the team despite the fact they play in Borehamwood) is not my favourite place after the Ryman Premier Play off last season. Almost a year to the day of those dark days of football I doubted significantly that the crowd would break the 200 mark. Whilst Boreham Wood’s first season at this level can be seen to be a success on the pitch, consolidation was always going to be the objective, you can hardly say that their promotion had set the town a-buzzing. In fact regular attendances of sub-200 makes you wonder how they actually funded their season. Even if everyone paid full price for admission (which of course they wouldn’t as there would be season ticket holders, comps, visiting officials etc) then they would get £2,200 in gate revenue approximately every two weeks. Whilst the playing budgets of most team are kept under lock and key, we know enough to say that no club operates anywhere near this level. One area where they have simply lost the plot is on pricing for Under 16’s. I nearly choked when I was told it was £6 for Lolly, a ten year old. Six pounds? That is absolutely ridiculous. Half of the clubs in the Blue Square South let Under16’s in free. The most expensive I had come across this season was £3 at Chelmsford City. Six pounds? You are having a laugh. I asked a steward if I could talk to the club secretary. He was busy, it was a match day after all. But the steward told me that the pricing was “fair and comparative to what other clubs charge”. Was it any surprise that there was no other under 16’s in the ground bar the two in the Lewes contingent and the ball boys. Hello…does that not tell you anything? Brian Potter once said “Children are our future” (he also said that Garlic bread was but we will ignore that for now). Premier League clubs are pricing kids out of the game, we all know that, but what else is there on offer close by? Watford? Luton? Barnet? Watford charge £13 for under 16’s which is hardly a bargain. And how many under16’s live in the estate surrounding the ground? A couple of hundred? Simple business idea here – let kids in free as long as an adult pays, thus kids will drag parents along, who then spend money on beer, sweets, etc etc. Am I being too sensible here? Don’t any of the officials of the club look around the empty terraces and think “where are all the kids?” Do they not look on with envy when they go to clubs like Lewes and see smiling happy kids wearing replica shirts, spending their pocket money at the club? Obviously not. The club shop at Boreham Wood sat open without any customers on this sunny day. What is the marginal cost of letting under 16’s in free? How many resources do they take up? The answer is zero. It is 100% profit so why be greedy?Reap what you sow. Boreham Wood 3 Lewes 0 – Meadow Park – Saturday 30th April 2011 Despite the poor attendance it was good to see bigger than normal Lewes travelling contingent. My one main criticism this season has been the fans have been too quick to get on the back of the team and management based on a view from home games alone. It has been the same dozen or so faces at most away games but for the last game a few more faces had come out into the sunshine. And with the game just a minute or so old they nearly had something to cheer about as a Wheeler free kick was flicked goalwards forcing the keeper to make a fantastic one handed save. Lewes actually played quite well for long periods of the hot first half. Talisman David Wheeler, undoubtably playing his last game for the club as he heads back off to college in West London for next season, kept sending the balls in for “The Unit” aka Danny Buckle, but the Boreham Wood back four looked quite solid and surely but slowly the home team got into the game, striking the woodwork in the twenty fifth minute from a shot from distance. With time running out in the half and the bar seeming the best option for us, Boreham Wood took the league. A corner was floated into the Lewes box and the defence were obviously concentrating on their half term oranges as Risbridger headed home. Half time scores were looking good for a third from bottom finish as long as they could turn around this game. But they couldn’t. Wilkinson doubled the lead with another header from a set piece in the 68th minute and three minutes later Garrard added a third. It was harsh on Lewes but on many an occasion since Christmas they had been put to the sword by teams in the second half of games. So the referee brought an end to the game, and Lewes’s season. Where we will end up is now completely out of our hands. Rumours are rife about clubs up and down the pyramid who are looking for a way out of their current financial situation by taking a voluntary relegation. But that is for another day. The team sat on the pitch in a circle as manager Tim O’Shea debriefed them. How many would be in a similar situation in just three months time? We can but speculate. We said our goodbyes to David Wheeler, our David Wheeler who has shown commitment to the club in the past three years and he looked genuinely sad that he was (probably) leaving the club in such a circumstances. But he has to move on. After all Football is a business, right?